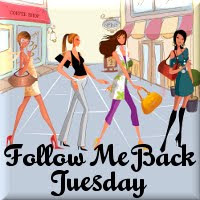 Follow Me Back Tuesday is hosted by Survey Junkie, Little Yaya's, Review Retreat & Boobies,Babies And A Blog.. It's a great way to start off your week & get more BF's !! Hi! I am a new GFC follower from FMBT. Following you back. Have a wonderful Tuesday! Happy Follow Me Back Tuesday! Thanks for stopping by my blog, Mother of Pearl It Is. Following you back from FMBT! Thanks for stopping by! I am just getting started this morning on my follows...west coast girl and I just got the kids off to school! Enjoy your day! Thanks for stopping by and following. I am now following you!